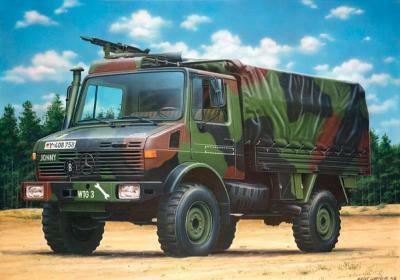 This is the 1/35 Scale Unimog (Lkw 2t tmilgl) Plastic Model Kit from Revell®. Suitable for Ages 13 & Older. Awsome great asset to my War on Terror diorama. 8&apos;x8&apos; description of activity in Iraq, Afghanistan war zone with US Military Bases and Air Strips. Injection molded plastic parts, beautifully scribed with impressive details Rubber wheels Detailed driver's cab Platform with tarpaulin Detailed chassis Waterslide decals for four versions: 1) 4. Panzerbataillon 383 2) 3. Wachbataillon, BMVg, Sieburg, 2007 3) ISAF, Kabul, Afghanistan 4) Koniglich Belgische Armee, 2004 Illustrated assembly guide.